I spend a lot of time in my own head (at this point many of you are like – uh DUH), but stay with me and hopefully you will see where I’m going. As many of you know, managing the care of those we love is hard. When every doctor’s appointment reveals yet another health issue, trying to stay positive can become challenging and the stress can lead both loved ones and their caregivers to become focused on a future of despair. What is most problematic about this way of being is that we are living into a future that has not yet arrived missing out on creating joy in the moments we are currently in. Reality Check – We don’t REALLY know what the future holds. Many of our fears may come to fruition, however; to function day-to-day in that fear only leads to unnecessary anxiety and stress causing us to miss out on moments of joy and time spent with those we love. Tips on getting out of your head. Talk it out – connecting with a support group or 1-to-1 counseling can help in working through the fears we have and gaining some perspective on what are real concerns and what are “created” concerns. Surround yourself with positive people – Take inventory of friends and family to minimize time spent with the “drama enhancers” and schedule more time on those who create joy and have a more positive outlook on life. 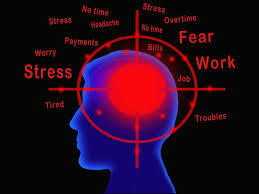 Get organized – chaos in our lives and schedules can create more stress. Organizing your home and your calendar can help relieve some of the visual stress. Ask for help – most people don’t want to “burden” friends and family with their “stuff”. However; allowing others to help will relieve stress and is gift you can give to those who want to help but don’t know what to do. Take one day at a time – you can only be where you are right now. Projecting ahead and stressing about the future is an exercise in futility. It does nothing positive for your mental or physical health. Canadian Scientist Hans Seley said “It’s not stress that kills us, it is our reaction to it.” Though we may have little control over the diseases we face, we do have control over how we react to it. This entry was posted in aging, caregiving, elders, encouragement and tagged aging, cancer, caregiver, caregiving, eldercare, elders, encouragement, getting old, self-care, Stress management, support. Bookmark the permalink.